Many years ago, I was on the board of a fairly well known 501(c)(3) organization focused on educating the public on the realities of life as a first mother. My position involved assisting with member communications and website management. Our efforts, however noble they may have been, were continually dampened by personality conflicts. This strong personality bucked heads with that strong personality. Meanwhile, not so strong personalities retreated to the corner and watched. Tempers flared, feelings were hurt, and very little work was done. Around the same time, a well known adoption activist outside our organization was publicly threatening to shoot one of the board members for disagreeing with said activist. Out in adoption land two separate adoptee organizations were struggling with their own infighting. Eventually, I resigned from the first mother organization. While I fully supported their mission and wanted to help, I found them too focused on one upping and sandbagging each other. I have that sort of drama in my own family. No need to volunteer for it. After resigning and while pondering the various personalities, I realized that what each person wanted, no, demanded was to be seen and heard. Every member was talented, educated, and committed yet we could not get out of our own way enough to do any real work. We lacked emotional intelligence. Our overwhelming need, no surprise considering we had each been disposed of by our families in one way or another, was to be loved and cared for. I reflected on this experience when Joyce made her ending comments to her keynote. In her case she was referring to the AAC Board. Admittedly, I do not know the details of what is going on with the AAC. I am merely a member who has heard bit of gossip or been invited to view scandalous and inappropriate (to me) Facebook pages. I am in no position to comment or judge their drama but I do believe I am in a position to ask what can we do about it? This was the question I brought to Joyce following her keynote. Given her work with adoption traumatized individuals as well as her clinical experience and education, what would she recommend? 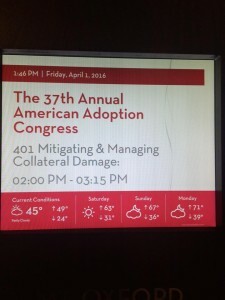 How can we solve this for AAC and other adoption reform organizations? I am generally more interested in solutions than I am in assigning blame or pointing fingers. Joyce suggested (and I agree) that nearly every single person working in adoption reform comes to it from a place of pain, loss, and trauma. This trauma gets in the way. Okay. What can we do? Joyce had no clear advice. I questioned how organizations like Donaldson are able to perform. Are they not also populated with adoption impacted individuals? Joyce noted Donaldson is staffed with paid professionals. They have a very different operating model for their organization versus a volunteer staffed organization. Point taken. Does a formal position and associated compensation make a person behave professionally? I am going to guess the answer is “no”. Joyce and I were interrupted by a session starting and as a result we did not finish our conversation. Others at the conference suggested that this is a phase AAC is going through and they have been there before and recovered from it. They will again. I suppose that is reassuring but I still ask the bigger question. Can we solve this for AAC as well as other organizations? If we do not, can we truly make progress if we are constantly bogged down by our shared trauma? It feels like two steps forward and three steps back every time an adoption reform organization attempts to make change.